I’ve got that good old Ferris Bueller’s Day Off quote stuck in my head. Can you believe how young Matthew Broderick looks in this photo? Do you think he looks at this picture and thinks of his character’s iconic quote, and thinks “sheesh, I’m sick of hearing those words but a heck of a lot has happened since I became famous for saying them?” Maybe I will tweet him and ask. I have been dwelling on this thought a bit over the past few days. I think maybe since August 1st when I woke up and said, “Holy Moly it’s August!” Or I looked at my count down app on my phone and realized I have just 33 days left until the wedding. We’ve been counting down and planning and hoping and changing and growing so much in the last two years that it feels rather surreal to be only a month out to the big day. I’m not going back to school, but I’ve got that feeling of back to school anxiety as I know the summer is winding down. We didn’t get the chance to go camping, or take much vacation, or go to the beach because we’ve been meeting caterers and doing tastings, and scrimping on budget, and making things out of tulle and poking and proding ourselves into dresses, and laughing through this funny process called planning a wedding instead. I was writing in my journal about how messy our house is, and how frustrated I can get that I don’t feel like I have a ton of time to catch up on laundry and I want envelopes to go away, and receipts, and planning books, and to do lists to reach completion. It would be nice to see the surface of my kitchen table. Then, I felt like this little voice was saying, ‘the wedding is going to be done in only 33 days! Enjoy this mess, enjoy the tulle, enjoy the to-do lists’. Ferris is right – this is all moving kinda fast. This week I don’t really feel I have one prolific beautiful moment. Instead, maybe I just slowed down a tiny bit to observe a few beautiful moments in other’s lives. On Friday night one of my best friends came to visit and we got to catch up on life and talk about dating and boys (are we old enough to call them men?) and we decided perhaps your twenties are the decade you figure out all that you thought you were going to do is a scam; it’s more fun to start doing all that you want to do. That’s a freeing thought isn’t it? We were downtown and I saw a mom with 4 kids all in matching pastel outfits eating ice cream on a bench, That’s a beautiful image. Summer is about ice-cream, and bright colors, and lining up with family to enjoy a nice evening out. Or maybe you don’t enjoy it so you just get your mom to buy you ice cream. Saturday I got to take my new favorite bus downtown with my mom. We joked about the people riding it, talked about social anxiety, and I waited patiently for her while she got her hair done. I know we may not always live close enough where I can ride my bike to her house, walk to the bus, spend all day with her wasting time and drinking coffee and playing caddy games. Have I mentioned how awesome my mom is. 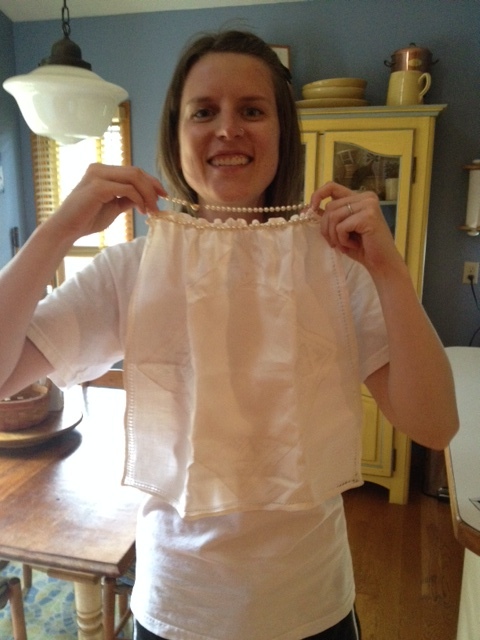 She made me a wedding bib – isn’t this beautiful? I’ve been having so much anxiety about spilling Italian food on my white wedding dress that we’ve always joked about me wearing a bib for the big day. Well she made one. And it actually looks kinda elegant. It’s beautiful to me. I can’t wait to wear it. Today, as I went to get coffee at the coffee shop that is WAY too close to work an older woman was outside singing and playing her guitar. (I broke down – resisting lattes is SO hard). What courage it takes to be yourself and be vulnerable with a guitar and a beautiful voice and some lyrics that portray her view of the world. I’m not good at slowing down, and I spend a lot of time wishing I was somewhere else. I think this week, though, I was just reminded to look for the little things again because heck, this year is moving pretty fast. Only 33 days! And then the next big adventure will begin. What little things can you notice if you slow down? Would you wear a wedding bib? Do you like 80’s movies?